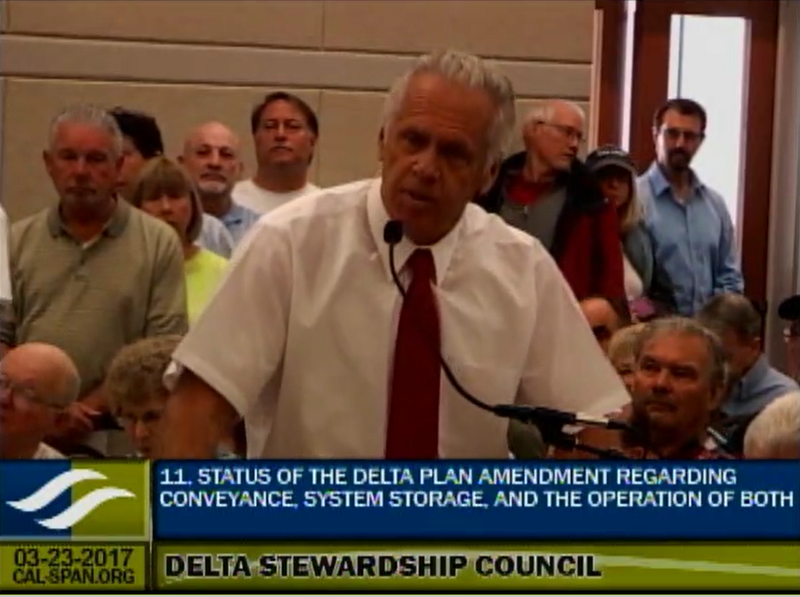 It was standing room only for the Delta Stewardship Council’s March meeting, held last Thursday in Brentwood, as Restore the D elta, Save the California Delta Alliance, and other opponents of the California Water Fix project were out in force to hear the latest and weigh in on the Council’s pending Delta Plan amendment regarding conveyance, storage, and operations of both. 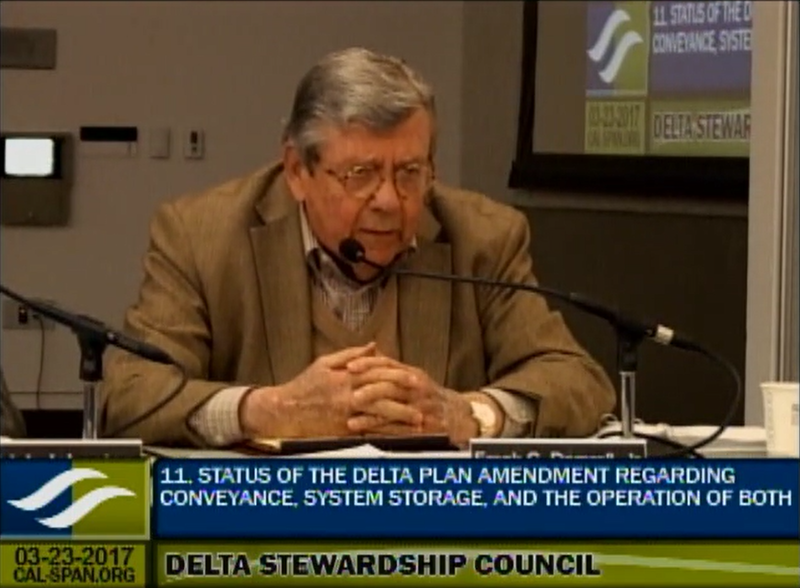 At the February Council meeting, a discussion draft an amendment regarding conveyance, storage, and operations was presented to the Council. At that time, Council provided comments to help refine the draft amendment. Following that meeting, Council staff held three workshops to hear additional public comments. At this meeting, Council staff discussed potential changes to the discussion draft, with the plan to bring back a revised draft of the amendment back to the Council in April that will incorporate the comments received from the Council and the public for further discussion. Executive Officer Jessica Pearson introduced the agenda item, noting that the first draft is the culmination of about eighteen months of discussion with the Council, public input, staff and consultant work. 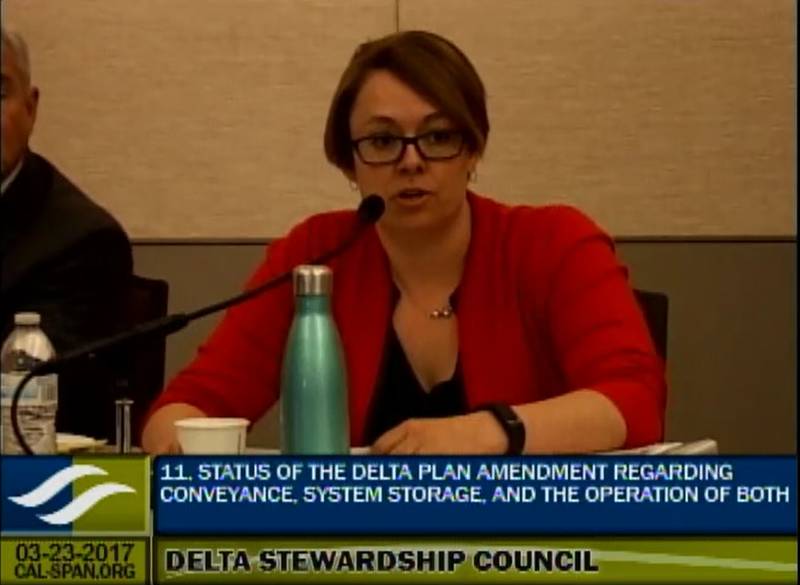 “This is all related to a commitment we made in the Delta Plan to revisit the topic of conveyance, storage, and the operations of both to achieve the coequal goals, which is a requirement of a plan in the Delta Reform Act,” she said. Ms. Pearson then turned it over to Bethany Pane, Chief Counsel for the Council. Council staff received many comments at the February Council meeting and has organized them into themes, found on page 2 of the staff report. Cassandra Enos-Nobriga highlighted some of the themes in the proposed revisions to the discussion draft. Following February’s Council meeting, public workshops were held in Tracy, Diamond Bar, and Sacramento to solicit feedback from the public which were attended by representatives from water agencies, state resources agencies, and NGOs. 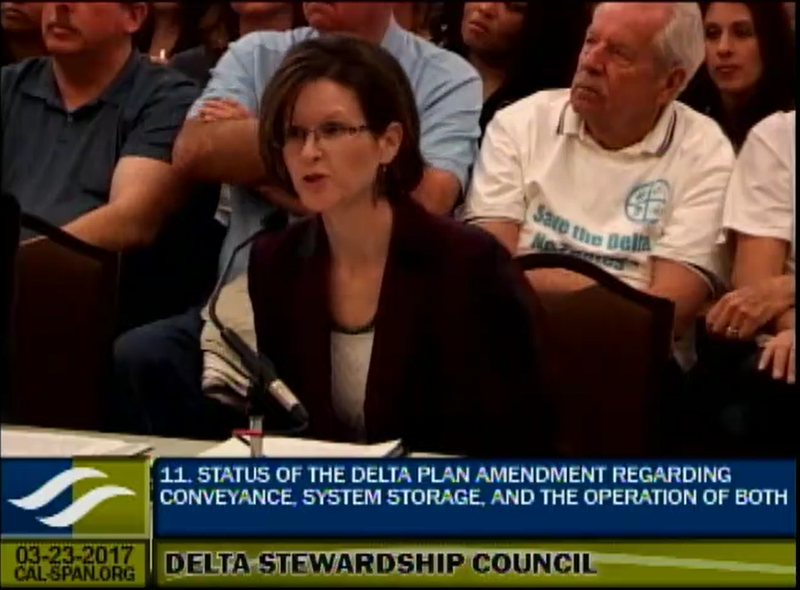 Kari Shively, consultant with Stantec, then presented a summary of comments received and potential edits to the draft document in response. Ms. Shively said she would not review all the comments or themes, but would highlight a few of them and how they will be addressing them as the discussion draft amendment moves forward. A more thorough report on the comments and themes is available in the staff report. 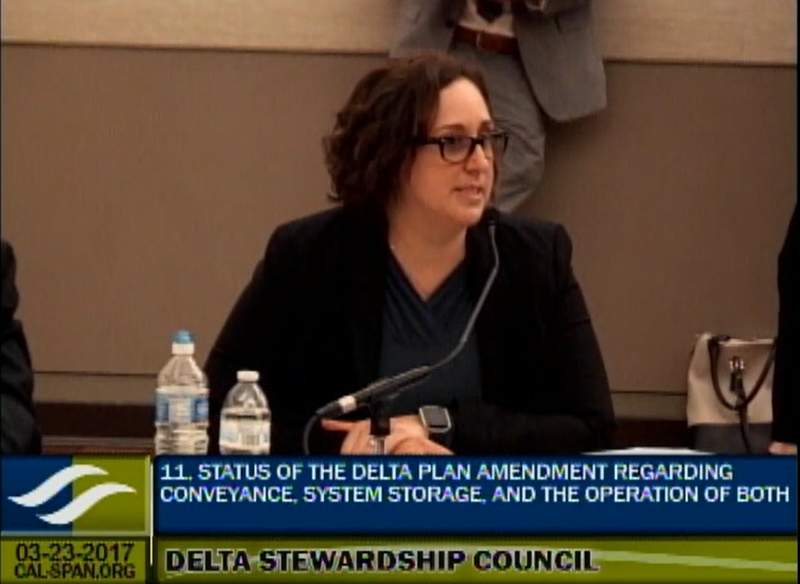 “So in summary, I think we received a great deal of constructive feedback that we are actively using to help improve the draft that we put out as a discussion draft, and we also look forward to hearing additional feedback today as we move forward,” concluded Ms. Shively. Ms. Enos-Nobriga then discussed next steps. 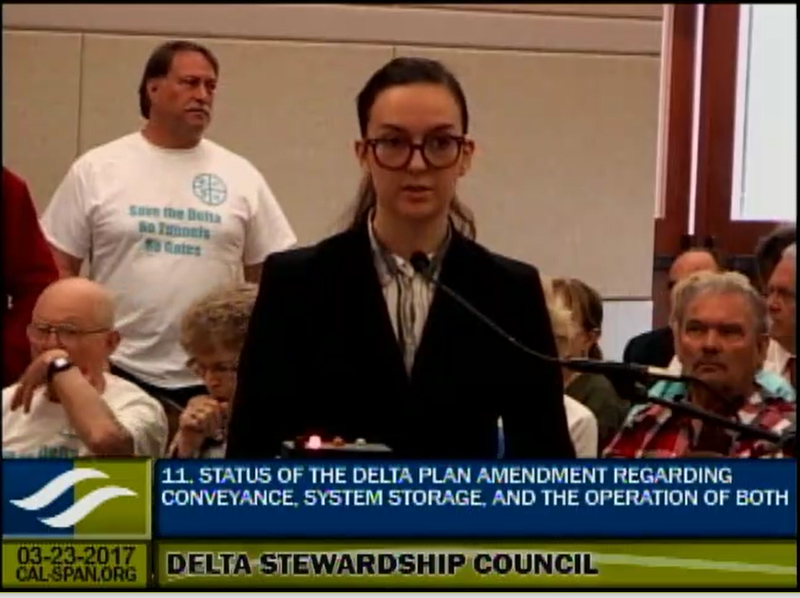 A CEQA scoping meeting was held on the day following this meeting (March 24) for all the proposed amendments to the Delta Plan, including the Delta levee investment strategy, conveyance, storage, and operations, and performance measures. They will be developing a scoping report and presenting a summary of the scoping meeting at the next Council meeting. Comments on the CEQA scoping will be accepted through email and regular mail through April 17. Next month, staff anticipates coming back with revised version of the discussion draft that incorporates many of the comments and responses discussed today. 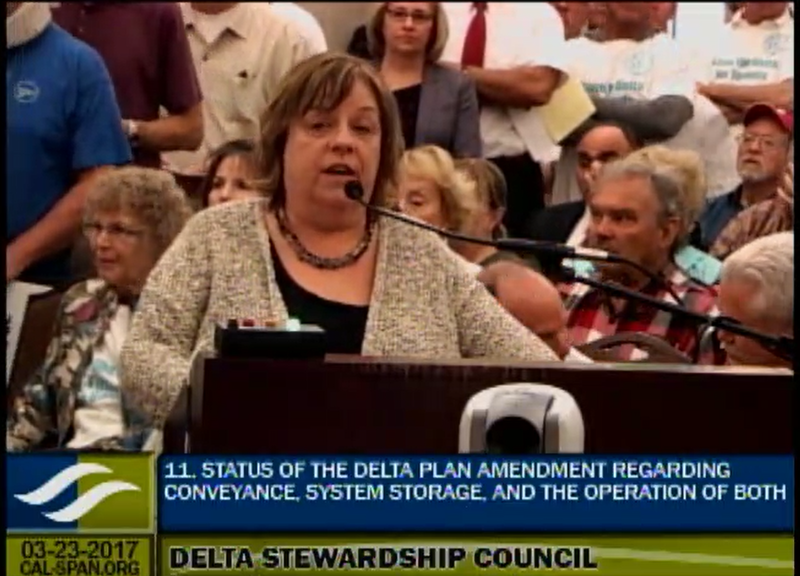 Over 30 speakers then gave public comment on the conveyance, storage, and operations amendment. 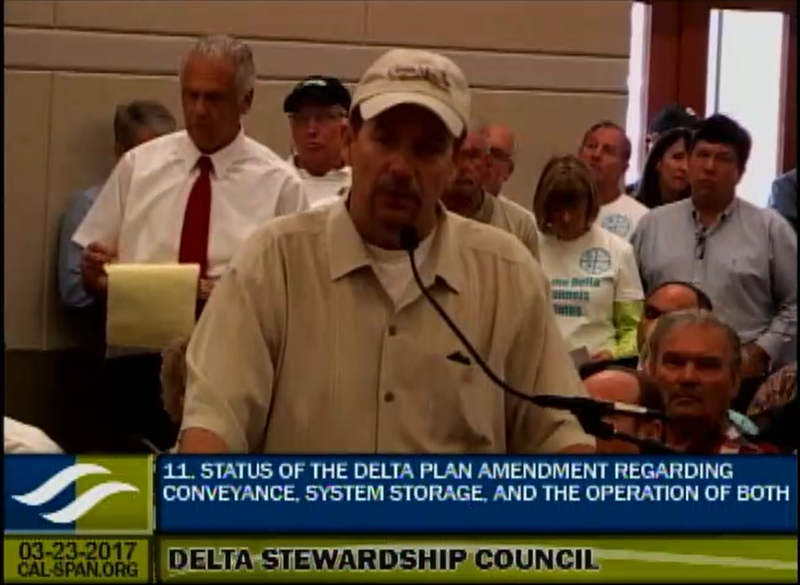 Speakers ranged from representatives of organizations to Delta business owners to public citizens. Some pitched projects to bring in water from other states, more desalination, and for building a big fish screen in Clifton Court Forebay; boaters expressed concern for construction impacts, and realtors spoke of concern for property values. 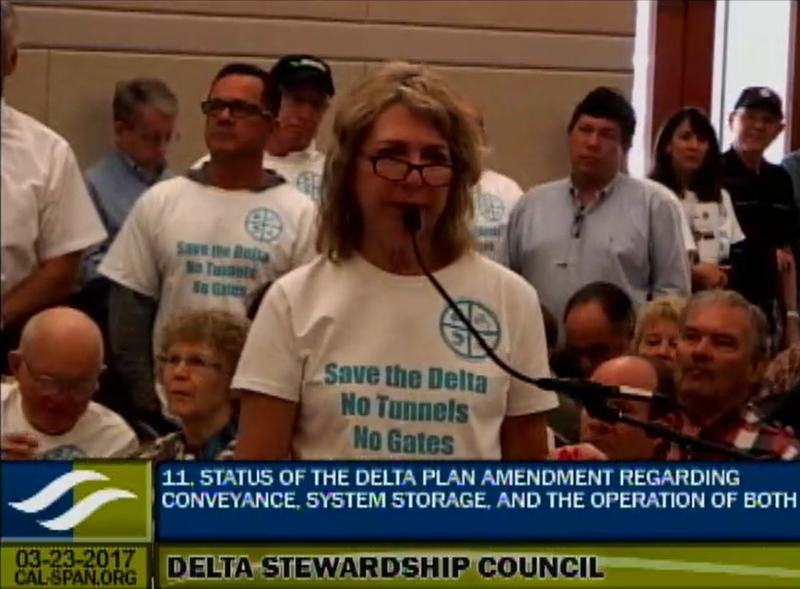 All spoke passionately about the Delta and were opposed to the tunnels, and therefore to the amendment to the Plan, and speakers generally received boisterous rounds of applause. 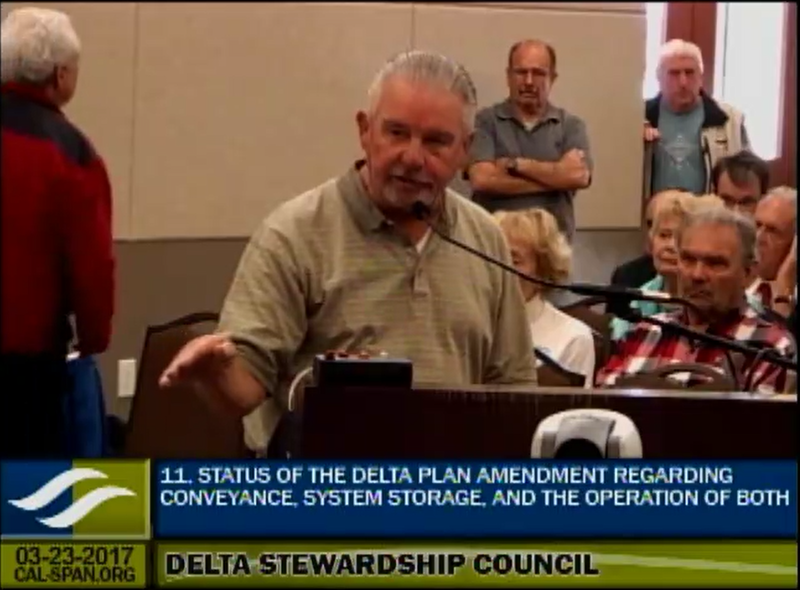 As a representative of California State Assembly Delta district and co-chair of the California Legislative Delta Caucus, I write today to voice my opposition to the proposed water conveyance, storage, and operation amendments to the Delta Plan deliberated by the Delta Stewardship Council. I proudly represent the 11th Assembly District and the almost half a million residents that call this place home. 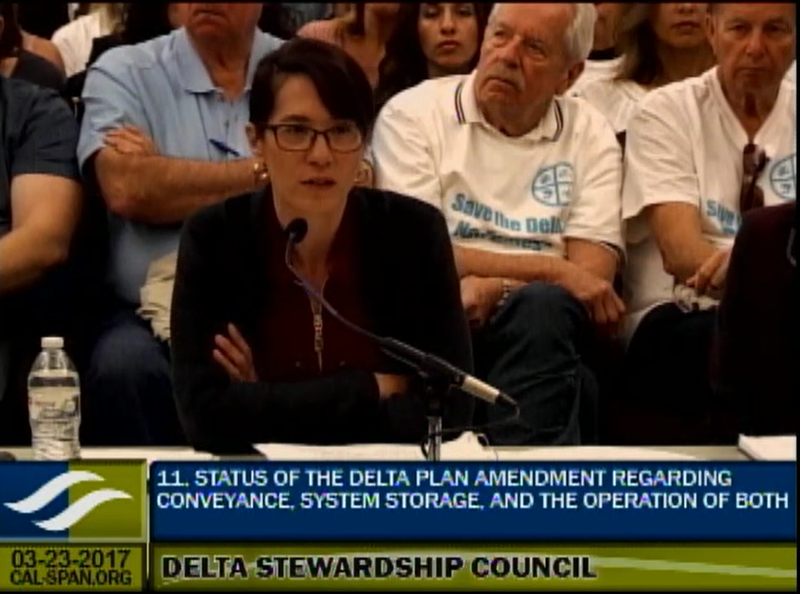 The key feature that unites people around the district is our shared cultural, social, and economic attachment to the heart of the Delta, a unique environmental, geographic place in California that demands protection. 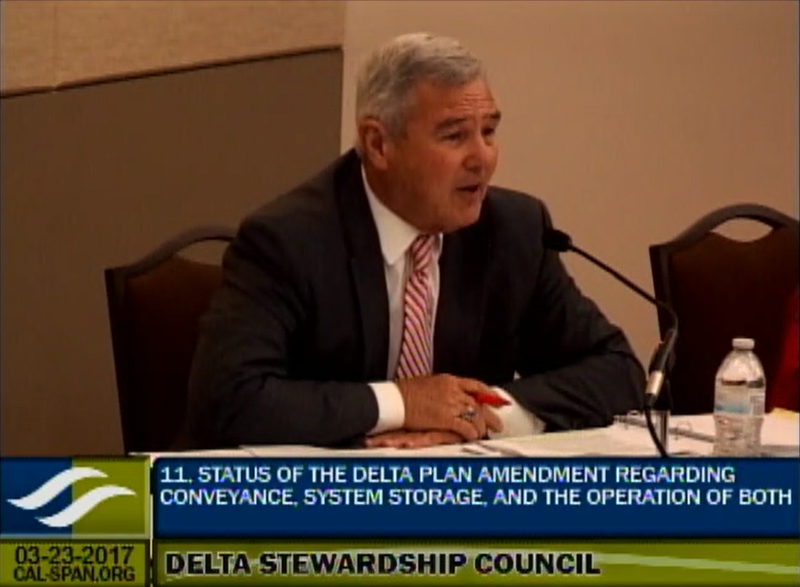 Any proposed change of Delta flows must preserve our ecosystem and water quality, which indisputably benefits habitat for our fish, birds, and other wildlife as well as sustains local agriculture, commercial, boating and recreational industries, and my constituents’ way of life. 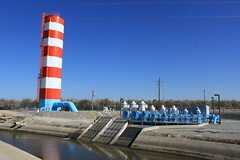 The state legislature and Governor Schwarzenegger explicitly recognized the need for protecting the Delta in 2009 when they passed the Delta Reform Act which established coequal goals. 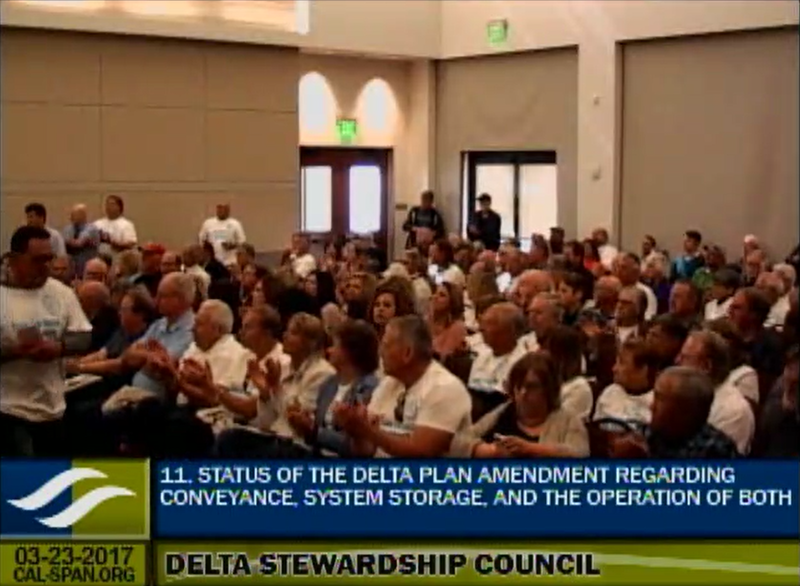 The Delta Stewardship Council was created to uphold and implement these coequal goals of water supply reliability and protection, restoration, and enhancement of the Delta ecosystem. 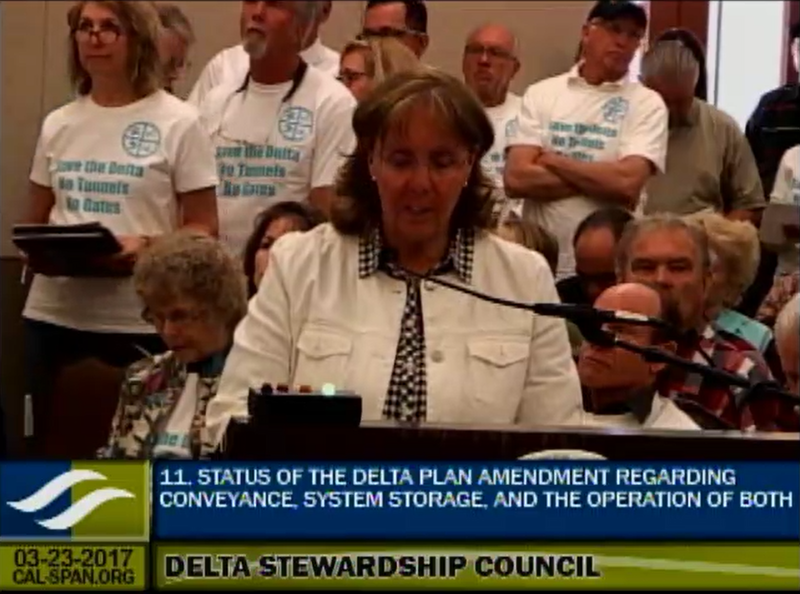 The proposed Delta Plan conveyance amendments put forth by the Council barely touch upon the importance of protecting the Delta’s ecosystem. As stated last year in my bill, AB 2583, and this year in my bills AB 791 and AB 792, appropriate fiscal and environmental safeguards must be applied to any new conveyance project. 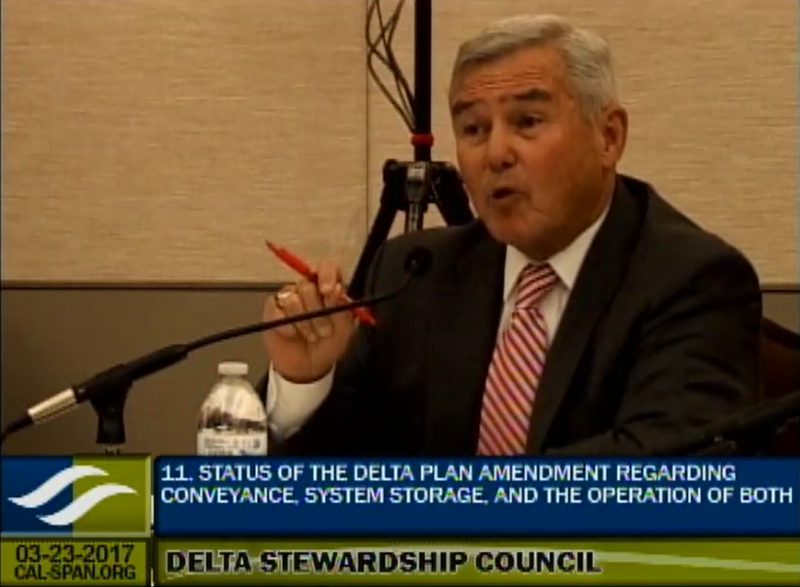 While the amendments state in the section dedicated to water principles that cost effectiveness should be a major factor, there’s no similar mention when referring to Delta conveyance. This is worrisome since there have already been major concerns brought up regarding the financing of the proposed current conveyance project, the California Water Fix. 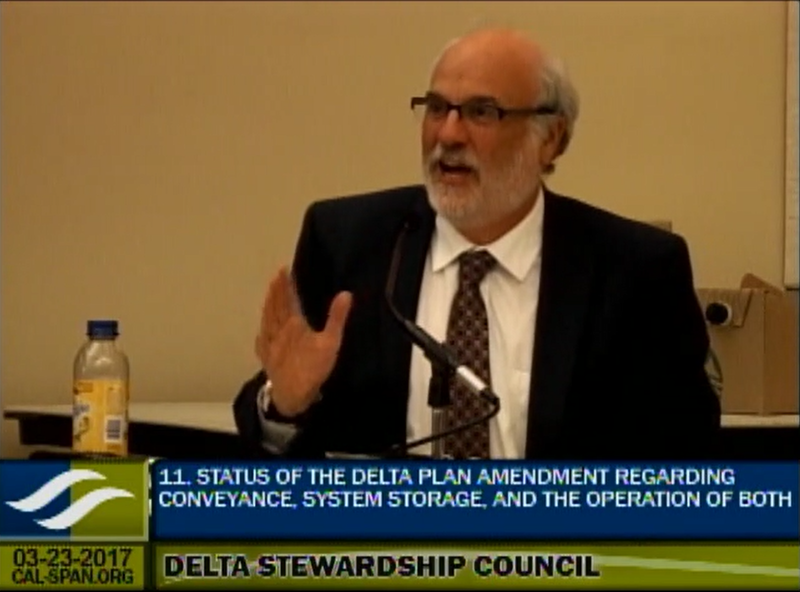 The Council should consider adding a principle that deals with the cost effectiveness of any Delta conveyance project or be prepared to answer questions from the public as to why it would implicitly be stated to be a guiding principle of water storage but not conveyance. 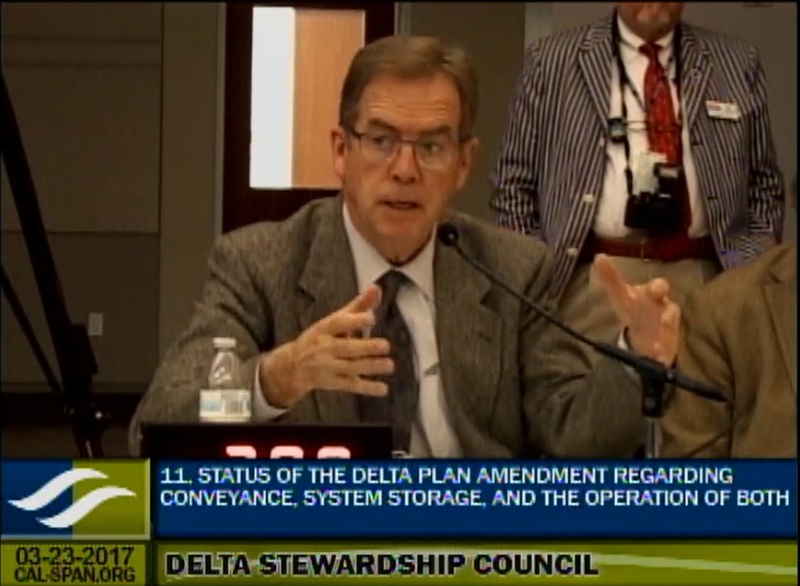 In summary, those agencies considering future conveyance proposals must prepare financing options and demonstrate the manner in which an alternative conveyance reduces reliance on the Delta, protects the ecosystem, and promotes increased storage as a whole as required under the coequal goals under the Delta Reform Act. Any Council action must enable my constituents and others who may be impacted by this proposal to have the unobstructed opportunity and right to review and offer guidance in an open, transparent and participatory process. 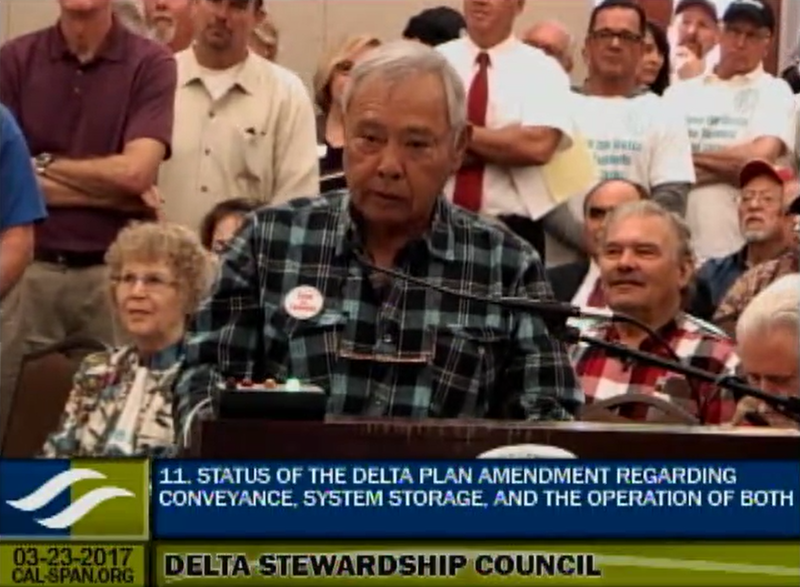 Therefore I urge the Council to reconsider the needs of the populace of California, especially those of us who live in and rely on the Delta within the 11th Assembly District. Chair Fiorini thanks the crowd for the comments, and notes that all written comments received as well as the webcast will be posted at www.deltacouncil.ca.gov. At this point, council members had the opportunity to add their comments. “That’s okay, I have copies of it,” said Mr. Thomson. “I anticipated it not being handed out.” (applause) Chair Fiorini also noted that it is posted on the website. Chair Randy Fiorini starts to call the lunch break, member of the audience asks when the Council will be giving direction to staff. At that point, no other council member wanted to add their comments, so Chair Fiorini then closed the agenda item and the Council broke for lunch. For full agenda and meeting materials, click here. To view webcast, click here.